Cut by J. Stevens jun. Ah! Classic John III carving. I've looked at this stone many times. And harking back to one of your earlier posts, if memory serves me this stone for an African-American adult male is the same size as the stones Stevens carved for adult white males, rather than carving a child-sized stone. Just so you know, I took the Newport Historical Society's "Buried Newport" walking tour today (when cruising GoNewport to find something to do on a day when I had no errands, and with your "Gravestone of the Day" in mind, this tour popped up and caught my eye). It visits all sorts of places associated with African-American history in Newport, talks about the slave trade and Newport, and ends at God's Little Acre. The guide today was conflating Zingo and Pompey Stevens, and she even said that Pompey Brenton's stone was carved by Zingo. I pointed out John III's signature (which, btw, is getting less and less readable; somebody needs to tell the damned maintenance crew to stop using weed whackers around the stones!). A little later on I mentioned the controversy on the whole African Stonecarver thing, and talked about Vincent Luti's research findings, that Zingo and Pompey were different men belonging to different branches of the Stevens family, and that there was no evidence that Zingo carved stones while there was plenty for Pompey being a professional carver. So apparently the NHS is still following the old line, and still telling it to the public. 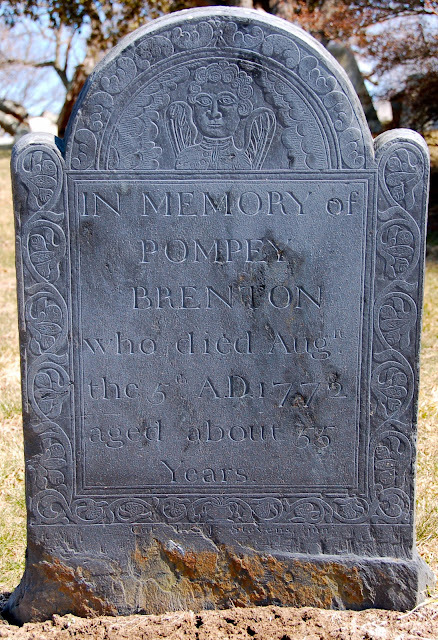 And I was wrong about the size of Pompey Brenton's stone; now that I've stood in front of it again, I note that it's the size of an adult white woman's. It's too bad that they're still conflating Pompe and Zingo Stevens. Maybe your mentioning it will get the person who gives the tour to google it and find the discussions of the evidence!